UNSW has a number of campuses, all easily accessible by public transport. We recommend planning your trip in advance to ensure that you have plenty of time to get to your classes. Limited parking is available and is marked on the maps below. During Orientation Week there are campus tours available which will help you to become familiar with the layout of the campus. For more information on how to get to the campus visit the Getting to Uni website. To help you find your way around campus download the Uni-Verse app - UNSW Australia's official mobile app. Get it today on Apple or Android. The Paddington Campus (also known as UNSW Art and Design, formerly COFA) is centrally located on Oxford Street, Paddington and is easily accessible from the Kensington Campus. A courtesy shuttle bus operates between Paddington and UNSW Kensington campuses during semester, excluding public holidays. The shuttle bus stop is located at the Gate 8 entrance on High Street (UNSW Kensington) and at the Greens Rd entrance (Paddington). The UNSW Paddington Campus shuttle timetable is available here. Stay up to date with changes to the Sydney Bus routes and diversions due to the East Sydney Light Rail Project via the Getting to Uni website and FM Assist wesbite. Below are the list of buses from Sydney City and the surrounding suburbs to UNSW. You can take routes 392, 394, L94, 396, 397 and 399. Routes M10 and M50 operate via City - Park Street. 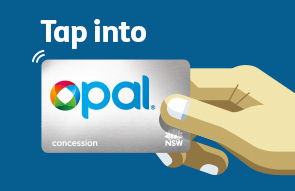 Students are required to give consent to UNSW to provide details of eligibility to Transport for NSW before they can apply for an Opal Concession card. UNSW students who are eligible for travel concessions will able to provide their consent through myUNSW when enrolling. International students cannot apply for a concession Opal card. Getting Started support services for Term 3, 2019 will be confirmed in Term 2, 2019. Information about support outside the Getting Started period. Fill in this quick survey about your experience with the Getting Started website.